JNN 08 July 2015 : The Holy Month of Ramzan is the Holiest Month of all the Month of the Islamic Calendar , and above all the Most important thing of the holy month of Ramadan is the Night of Importance (Lailatul-Qadr) – the night which is superior to a thousand months. The magnificence of this night in the Holy Quran is to the extent that Allah addresses His messenger as “And what do you know about what Night of Qadr is?” By referring to the holy Quran, we find that such kind of addressing is used only when Allah is referring to very important issues or when He is reminding people of very great events. For example, where the Recurrence day and its magnificence is mentioned and Allah has intended to inform people and draw their attraction to the huge events of that day, such kind of addressing is used. Likewise in this verse of Surah al-Qadr, if Allah is addressing His best creature and last messenger in this way, definitely He is implying the great magnificence of this night. In another verse the almighty Allah considers this night to have a higher value than nearly 30,000 ordinary nights. Such comparison of the Holy Quran is an obvious proof for the high value and great magnificence of such night. In the second series of verses Allah mention the special features of this night. Having such features causes the Night of Qadr to have special and unique effects among the other nights of the year. For example this night is called Mubarak. Mubarak means full of mercy and blessing. Applying such a word for the Night of Qadr states that this night has the capacity of abundant blessing to the degree that the revelation of the Holy Quran has taken place in this night. Also due to the abundant blessing in this night the gates of forgiveness and mercy of Allah is open to people. Another effect of it is that in this great night no punishment is assigned for the creatures. For the almighty Allah has named it a night full of Salam (Peace) till the break of the morning. It is better to search for the answer to these questions in the verses which are talking about this night. The verses in the Holy Quran confirm this fact. When discussing the events that take place on the Night of Qadr, the verbs are used in the continuous form. So this night is not limited to a certain age, time, or year, rather is repeated at different times. This night along with the different events that take place, such as the descending of angels, will be repeated in the present age. But if we focus more deeply on the verses of the Quran, we will discover more details on how this night is repeated continuously in the different ages. One of the clear points that can be seen in the verses is that the Night of Qadr is in the sacred month of Ramadan (this point will be discussed further in the next sections). Just as the month of Ramadan is reoccurring each year, the Night of Qadr is also repeated each year. Therefore, depending upon the level of attention we give to understanding the significance of this night, we too can benefit from the great value and blessings of this night today. As previously stated, by referring to the verses of the Quran, we understand that all affairs destined to happen in the universe and also to each person and other creatures in the following year, are made clear in this night. Moreover the angels will descend these destined affairs in the form of divine command. By referring to the verses which have talked about the descent of the angles, we can divide the descent of the angles according to their purpose into two groups. One type is when the angels would descend to execute the orders of Allah. Examples of this method can be seen in the descending of angels for the task of helping the believers in Badr, Hunain and other stage, taking the life of people, or the descending of angels to execute a punishment from Allah, like the punishment on the people of Prophet Lut (AS). The second type of descending is mainly to present the sacred affairs and communicate the message of Allah. It is clear that each message requires a receiver or an audience. Therefore in this manner of descending the angles deal with both Allah as the sender and a recipient. In other words the angles should receive the messages from Allah and then present it or descent it to a creature of Him. An example of this method of descending can be seen in the descending of Angel Gabriel to Prophet Muhammad (PBUH&HP). Angel Gabriel descended upon Prophet Muhammad (PBUH&HP) for twenty three years to continuously give the messages of Allah. Now we have to see, which method of descending do the angels have on the Night of Qadr. In the verse 4 of Surah al-Qadr Allah has talked about the descent of the angles and divine commands. In fact in this verse, we should see what the responsibility of the angles about these commands is. Are they to perform such commands? Or are they to descent them and inform these commands as messages? When Allah says that the angels will descend in it by the permission of their Lord, every command, then it is clear that this manner of descending is like the second type: to communicate a message. As it was discussed the descent of the angles in the Night of Qadr is for delivering messages. In this type of descending, the angels act as messengers from Allah to bring a message for a receiver. Therefore there has to be a recipient for the angels to descend upon and give the commands. Considering the descending of the angels and the message they carry, and supposing that the descent of angles is not vein, one can conclude that the descending of the angels cannot be upon every creation of Allah . Rather it should be upon a person who has the ability of receiving such extensive and important information. Not only different inanimate objects, plants, the animals, and even holy places are incapable of receiving such an important message, but also normal human beings do not have the capacity of receiving such an important message, including the distinction of affairs for all the humans. The distinction of the yearly affairs of only a single man is extensive amount of information. Now let us refer to the verse of the Holy Quran which implies that in that very night the angels reveal the distinction of all affairs, namely not only the distinction of the yearly affairs of you and I, but all the human beings on this planet. Therefore we simply find that an ordinary man can never receive such amount of information in just one night. On the other hand, the angels reveal the executive commands of Allah. In order for this act of angels to be considered useful, their descent needs to be followed by a result. In another words, the person who the angles descend upon should have a responsibility and role in the process of accomplishment of these commands. Now by a careful glance at ourselves and the people around us, we would find that not only we are not in the position to receive divine messages from the angles, but also we don’t have any role in relation with the distinctions of people. Now that we realize an ordinary human being cannot be the receiver of the decrees brought by angels, we can therefore expect that certain chosen people exist for this task. These chosen people must be far from any impurities or defects of any normal human being, and they must have the capacity of receiving and executing divine messages. In other words they must be Allah’s representative on the earth. This is the status which the Holy Quran refers to when talking about the representatives of Allah. The representative of Allah is one who represents Allah and with His permission does divine acts, like Prophet Jesus (AS) who was able to bring the dead back to life. The caliph of Allah on the earth is responsible for executing specific command and effects, in other words he is the connection between the heavens and the earth. It is obvious that the Caliph of Allah being His representative on the earth and in connection with Him should be able to receive and execute divine messages. Muslims all agree on the fact that in the age of the Prophet the only person whom the angels would descend upon for bringing the sacred messages was the Prophet Muhammad (PBUH&HP). During his lifetime, no one else would receive these messages. However, just as discussed above, the descending of the angels on the Night of Qadr and bringing the divine commands is a progressive act that is repeated each year. Therefore it did not end after the demise of Prophet Muhammad (PBUH&HP). And the angels continue to bring the distinction of people to a person. It is obvious that such a person should be the one who like the Prophet is appointed to by Allah to be responsible for divine affair like the descent of the angles upon him. Also he should be given the special abilities and capabilities by Allah. Naturally such a person is the continuer of the path of the Prophet and is responsible for the acts which he was responsible for and should be continued after him. To be more clear, he is the successor of the prophet and besides the representative of Allah on the earth. Historical sources have shown that after the demise of Prophet Muhammad (PBUH&HP), no one except a few have claimed that the angels descend unto him on the Night of Qadr. If they had done such, their claim could be easily defeated by asking the people of his era a few simple questions about the future and its specifics. However there were a few who claimed that angels would descend upon them, and they would defend their claim through legitimate proof. They, like the Prophet Muhammad (PBUH&HP) had such a vast knowledge about the incidents of the world that the people of their era would easily realize that they were the most knowledgeable Man in their era. The biographies of these certain people confirm this claim and open a whole new subject that will need to be discussed in other articles. Let it not be unsaid that these people are none other but the one who the Shiites believe in their Imamah, the successors of Prophet Muhammad (PBUH&HP), the representative of Allah: Ali and the eleven infallible Imam from his progeny (PBUT). From the above argument, one can deduce that there must be a leader chosen by Allah, a representative of Allah at all times so the angels can descend upon on the Night of Qadr for bringing the destinies. Based on this reasoning the Shiite Muslims believe that after the demise of Prophet Muhammad (PBUH&HP), the angels would descend upon the representatives of Allah and true successors of Prophet Muhammad (PBUH&HP) on the Night of Qadr. And in our present age, each year the angels descend upon the living Imam of the time, Imam Mahdi (May Allah hasten his appearance) to bring the destined affairs. Through verses of the holy Quran and the Prophetic narrations we can deduce that the Night of Qadr is in the holy month of Ramadan. In one verse, Allah confirms that the Quran was revealed in the month of Ramadan, 22 And in another chapter, it is made clear that the Quran was descended on the Night of Qadr, “We have indeed revealed this (Quran) in the Night of Qadr.” 23 Since in the first verse it was made clear that the Quran descended in the month of Ramadan, and in the second verse it was said that the Quran was revealed in the Night of Qadr, then we can conclude that the Night of Qadr is in the month of Ramadan. In addition to the verses of the holy Quran, narrations from Prophet Muhammad (PBUH&HP) and from the Ahl al-Bait (the Imams) also confirm that the Night of Qadr is in the month of Ramadan. The Quran does not reveal the exact Night of Qadr, but the traditions give more detail as to which nights have a higher possibility to be the Night of Qadr. 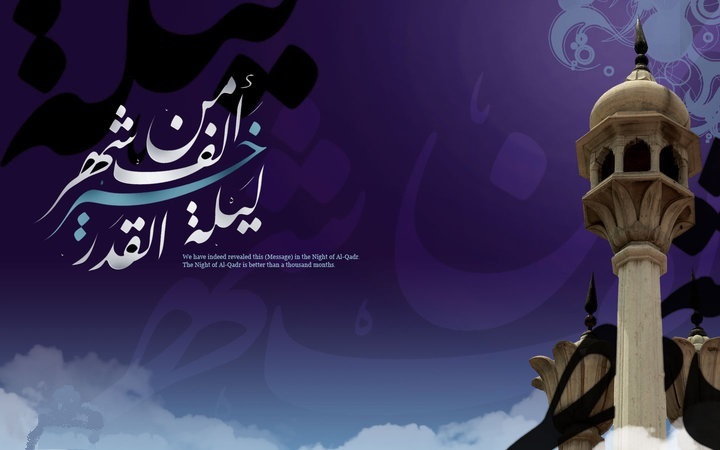 In these narrations, the infallibles have suggested that there is a strong possibility that the Night of Qadr may be on the 19th, 21st, or 23rd of Ramadan. However the 23rd of Ramadan has been given the strongest possibility for being the Night of Qadr. On these possible nights of Qadr, it is best to act upon the recommended acts and pay attention to the worships we are advised by the Infallible Imams (PBUT). Of the recommended acts in this night is best to stay up till dawn and think about the issues which help us keep closer to Allah. For example it is proper to sit aside and investigate our acts in the past year. Where were we last year and where we are today? By thinking about these issues we can get prepared for benefiting better from this night. We may ask Allah a better distinction in this year. We may ask Him to help us follow the path which He is satisfied with. We may ask Him to forgive us in this night which He has promised us the forgiveness for the incorrect acts we have committed. We may decide in this night to obey Allah more than before. This entry was posted in Articles and tagged holy month of ramazan, Important Night, Islamic calendar, Lailatul Qadr, Odd Nights. Bookmark the permalink.